Overall dimensions 1367 w x 947 f to b x 875mm high. Internal drawer dimensions 1257 w x 913 f to b x 65mm deep. Drawers mounted on ball bearing extension slides and fitted rear hood. Chrome handle and label holder fitted to drawer front. Internal drawer dimensions 1257 w x 913 f to b x 37mm deep. Finished Goosewing Grey for use with Plan Chests ref. BSS-50 and BSS-52. Comprising 3 x shallow drawers, internal drawer dimensions 1257 w x 913 f to b x 37mm deep, and 6 x deep drawers, internal drawer dimensions 1257 w x 913 f to b x 65mm deep. Comprising 6 x shallow drawers, internal drawer dimensions 1257 w x 913 f to b x 37mm deep, and 4 x deep drawers, internal drawer dimensions 1257 w x 913 f to b x 65mm deep. Overall dimensions 1019 w x 700 f to b x 875mm high. 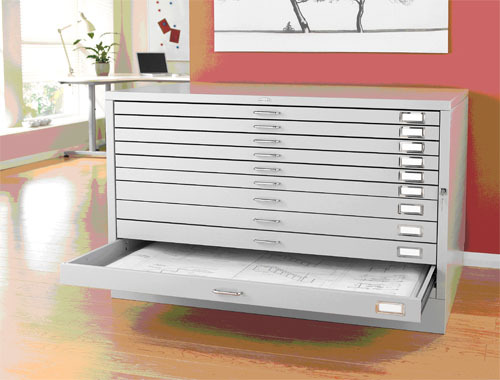 Comprising 8 x deep drawers, internal drawer dimensions 909 w x 666 f to b x 65mm deep. Slot in Drawer Dividers for use in deep drawers, 400 long x 60mm high. Slot in Drawer Dividers for use in shallow drawers, 400 long x 30mm high.